From box CP/CENT/PC/03: FILE 13: Agendas; notes by Emile Burns and George Matthews; documents, January 1958. -- FILE 14: Agendas; notes by Emile Burns and Bill Wainwright; documents, including on London District CP and on party rules, February 1958. -- FILE 15: Agendas; notes by John Gollan and Bill Wainwright; documents, March 1958. 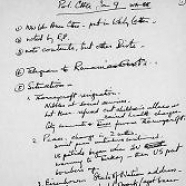 -- From box CP/CENT/PC/04: FILE 01: Agendas; notes by Bill Wainwright; documents, April 1958. -- FILE 02: Agendas; notes by Bill Wainwright; documents, including on Wigan by-election, June 29 demonstrations, municipal elections, May 1958. -- FILE 03: Agendas; documents, including on Wigan by-election, co-ops, June 1958. -- FILE 04: Agendas; notes by Bill Wainwright; documents, July 1958. -- FILE 05: Agendas; notes by Bill Wainwright; documents, August 1958. -- FILE 06: Agendas; notes by Bill Wainwright; documents, including on Inner Party Democracy, September 1958. -- FILE 07: Agendas; notes by Bill Wainwright; documents, including on YCL congress and CPGB rule changes; correspondence with R. P. Dutt, October 1958. -- FILE 08: Agendas; notes by Bill Wainwright; documents, including on Jewish question, November 1958. -- FILE 09: Agendas; notes by Bill Wainwright; documents, including draft congress resolution, December 1958. See also PC Sub-Committee files for this year. CP/CENT/PC/03/13: Agendas; notes by Emile Burns and George Matthews; documents, January 1958. CP/CENT/PC/03/14: Agendas; notes by Emile Burns and Bill Wainwright; documents, including on London District CP and on party rules, February 1958. CP/CENT/PC/03/15: Agendas; notes by John Gollan and Bill Wainwright; documents, March 1958. CP/CENT/PC/04/01: Agendas; notes by Bill Wainwright; documents, April 1958. CP/CENT/PC/04/02: Agendas; notes by Bill Wainwright; documents, including on Wigan by-election, June 29 demonstrations, municipal elections, May 1958. CP/CENT/PC/04/03: Agendas; documents, including on Wigan by-election, co-ops, June 1958. CP/CENT/PC/04/04: Agendas; notes by Bill Wainwright; documents, July 1958. CP/CENT/PC/04/05: Agendas; notes by Bill Wainwright; documents, August 1958. CP/CENT/PC/04/06: Agendas; notes by Bill Wainwright; documents, including on Inner Party Democracy (IPD), September 1958. CP/CENT/PC/04/07: Agendas; notes by Bill Wainwright; documents, including on YCL congress and CPGB rule changes; correspondence with R. P. Dutt, October 1958.